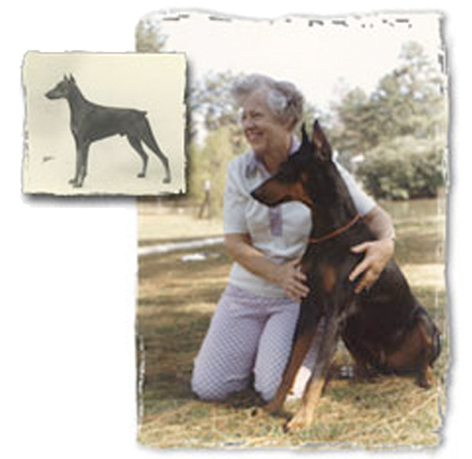 Mae L. Downing was the heart and soul of Mikadobe Doberman Pinschers. Mae’s father purchased their first dobe back in 1934 – they named him “Ritzi.” In 1940, Mae herself purchased Damasyn the Bat, call name, “Fury.” Fury was bred to Ch. Dacki Von der Elbe. Fury’s pups were whelped the day after her arrival in Japan where Mae and her husband were stationed. Out of that first litter, Int. Ch. Mikado Von der Elbe was kept and became Grand Champion Doberman of Japan in 1951 and 1952. The Mikadobe Dream had only begun.